New York City Mayor Bill de Blasio has taken down portraits of George Washington and others in Gracie Mansion, the city’s mayoral residence. The move was motivated by a desire to add more diversity to the walls of the historic home. The installations replacing the first US president include portraits of famous black Americans from 19th century New York City, such as abolitionist Frederick Douglass and slave-turned-philanthropist Pierre Toussaint. Other artifacts will portray the working people of the time of Archibald Gracie, who was living in the mansion that now bears his name in the early 1800s. The move was largely the result of the wishes of de Blasio’s wife Chirlane McCray, who is African-American and wanted the art and objects inside their 1799 home to be a broader reflection of the city’s history, which includes slavery. 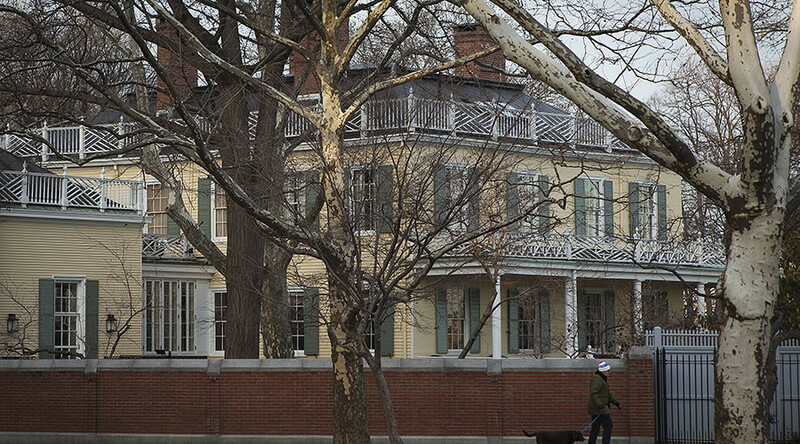 The first of 49 new pieces were installed in Gracie Mansion – one of the oldest wooden structures in the city – on Tuesday, marking the launch of an installation titled ‘Windows on the City: Looking Out at Gracie’s New York’, the Wall Street Journal reported. “The New York City experience has always been one of many peoples and many cultures. I’m delighted that this new installation will reflect our vibrant history – and remind us all that this city is always at its best when we make room for everyone,” de Blasio said in a statement. Most of the additions come from the city’s many cultural institutions. Documents at the exhibit will include the Gradual Emancipation Act of 1799 – which essentially ended slavery in New York – and a bill of sale for a slave named Maria. Also on display is a tomahawk given by English colonists to the chief warrior of the Iroquois in 1797. The painting of President George Washington – who owned slaves on his Virginia plantation – will be replaced by Toussaint, the former slave and wealthy hairdresser. Toussaint became the first layperson to be buried in the crypt below an altar in Manhattan’s iconic Saint Patrick's Cathedral, an honor normally reserved for bishops in New York City.